Award winning architecture, understated elegance, an extremely peaceful setting and state-of-the-art environmental features make this stunning home truly one of a kind. 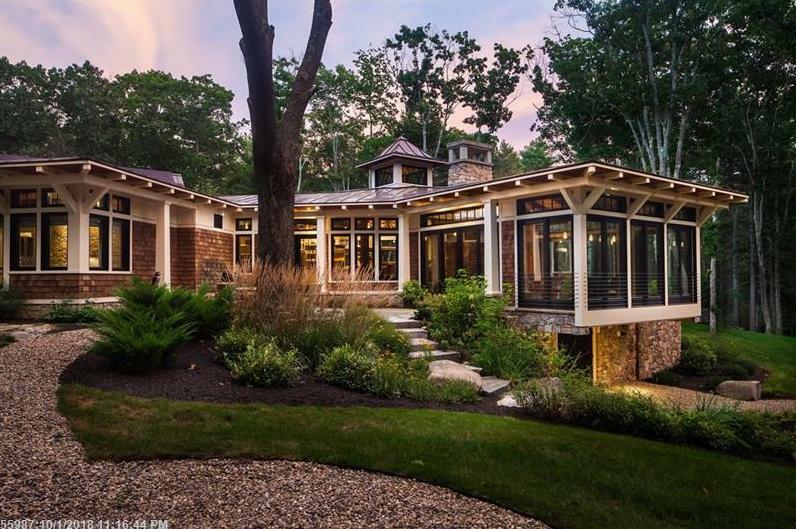 Set on 18 acres, this kind of privacy is rarely attainable so close to York Harbor. Walls of windows bring the outside in at every turn. Reclaimed bricks from NYC brownstones and magnificent Kings Pine beams fill the home with character. The open living space includes a state-of-the-art kitchen which boasts Viking appliances and a large butler's pantry. The living room and four-season sunroom share double sided fireplaces that reach to the ceiling, one gas and one wood burning, boasting granite hearths. The master suite offers a 4-person sauna, Italian granite and onyx flooring. Sustainable features include geothermal radiant heating and cooling systems, on-demand water heater and 24 photovoltaic solar panels. Here is a rare opportunity to own a beautiful retreat in the Maine woods so close to the Atlantic Ocean. 5 Bristol Lane (MLS #1368261) is a contemporary single family home located in York, ME. This single family home is 3,614 sqft and on a lot of 803,246 sqft (or 18.44 acres) with 3 bedrooms, 3 baths and is 3 years old. This property was listed on 12/07/2018 and has been priced for sale at $2,498,000.